Surface or open-pit mining is generally the easiest and quickest method for exploiting a gold mineral deposit if it is shallow and not buried beneath too much overburden or covering material. These operations may be large or small in scale and extraction is performed in different ways depending on location, terrain, the shape and size of the deposit, and available machinery. Here methods rely on the use of gravity as a means to concentrate and separate mineral grains of different specific weights when these grains are suspended in a liquid, turbulent medium. Heavier mineral grains tend to sink to the bottom of the vessel containing them when lighter weight material is washed away. In the exploitation of small alluvial deposits the following devices are common; the pan, the screen, the sluice and variants of these three devices. The simplest device for operation in a small, limited deposit is a simple pan or saucer handled by a single operator. The pan, generally, is a plate of steel or wood 25 to 55 centimeters in diameter and 5 to 7.5 centimeters deep with sloping edges 30 to 40 degrees to the horizontal. In operation the pan is filled with gold-bearing dirt, sand, or gravel, water is added and a circular motion rotates the water in the pan to continuously wash the contained material. This is done rapidly with the pan tilted, in such a manner as to flush the fine sand and clay out of the pan while leaving the heavier particles. Centrifugal force and water flow allow the heavy particles to sink to the bottom while the lighter portions gradually flow off the edge and out of the pan. At the end of the operation the gold grains and any other heavy minerals remain at the bottom of the pan. Screening or sieving is an operation in which a mixture of minerals of different sizes and of different specific gravities are separated into fractions by the action of water flowing over gold-bearing gravels placed on a sieve or screen within a hopper. The device consists of a square or elongated box without a lid. This box contains a steel screen with holes below which is a second inclined box divided into compartments, also called riffles. In operation a water jet washes the gravel material and larger fragments unable to pass through the sieve are rejected and mechanically discarded. 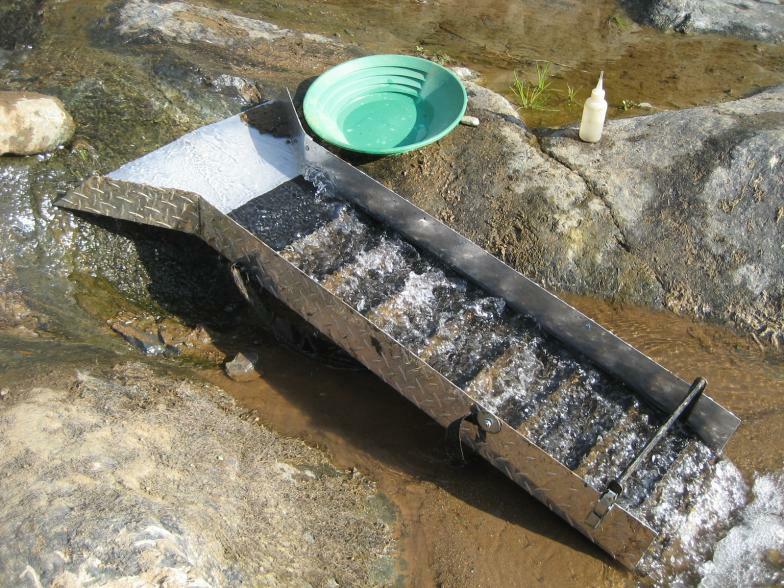 Smaller sizes are transported by the water stream to the inclined floor of the box below, where riffles or other obstructions trap the heavier, small gold grains carried along the bottom of the flowing water. Remaining lighter material carried by water flow is expelled from the inclined sluice. The material retained on the rifles is subjected to further washing to further recover contained gold flakes or nuggets. During operation the screening apparatus may also be shaken or oscillated by manual or mechanical means to complement action of the water flow. In auriferous alluvial materials or placers, sluices are the simplest and cheapest devices to use. They are also easy to build, relatively easy to transport from one place to another, offer good performance, are simple to operator, and require unskilled labor. A sluice is a long, variably sized box, typically of wood or metal, gently inclined less than 20 degrees, where running water can wash significant quantities of gravel quickly. Gold and other heavy minerals, as described above, are retained in a series of riffles conventionally arranged along the floor of the sluice. Sluice length must be sufficient to allow separation and retention of gold particles while the gravel itself is evacuated. With small size gravels, excavated material is emptied directly into the top of the sluice, and larger gold pieces retained. Pass through “concentrate” may be subsequently further processed to capture smaller grains. In larger operations, movement of gravel to larger sluices by more sophisticated mechanized means such as conveyers or trucks may be feasible. Getting the correct flow velocity and volume is the key to running a sluice. Too much water, moving too quickly will carry gold particles in suspension. Basically the upper layer of water in a sluice is not affected or slowed by the riffles in the bed of the box as much as the lower layer or “bed” flow. While turbulence is created in the lower flow by the riffle obstructions, the upper flow is more rapid and tabular. While the eddies behind the riffle obstructions can slow the upper flow layer somewhat, it is not as effective as the riffle itself. Alternatively, too little water flow or velocity, while allowing the gold to drop out quickly, also allows lighter, worthless material to drop out, filling the space between the riffles, eliminating the slow spots of turbulence entirely, and allowing the subsequent transported gold to flow out of the sluice. “Perfect” flow allows the gold and other heavy mineral particles to drop out of suspension and the lighter material to flow out of the box. A general rule of thumb for sluice boxes is 1″ drop per foot of length. So if a sluice box is 24″ long, about 2″ overall drop from upstream to downstream ends of the sluice is appropriate. Adjustments in slope, to accommodate variations in conditions and material, may be made from there. Finding a location in a stream that allows the flow and drop required to get your box running just right isn’t always easy. Usually, it is better to set up the sluice in a good location so as to get the right water flow. You can then carry your paying material to the sluice rather than continuously shifting sluice locations (often bad) to be close to your diggings. In some areas it may be impossible to find a good, safe spot with the right flow and drop (nobody wants to stumble and drown while lugging buckets of material to a sluice perched over some swirling abyss). Rather, you may be able to increase water flow in a nearby slower, shallower, and safer section of stream by setting up a “wing dam” to hold your sluice and manage the flow. A wing dam is essentially a rock barrier, often extending in a V upstream into the channel and outward from the mouth of your sluice box, that channels water into the box, thus providing adequate flow. Depth of water flowing through the box is often dependent on circumstances, but ideally you do want the water flowing through the channel of the box, not over the top sides of it. Try to obtain a water line about midway up the side of the sluice. Still, don’t agonize over depth–it is total flow that matters most. Once one achieves what is hoped to be the right flow, it’s always a good idea to place a large rock across the box to anchor it and hold it in place. The risk of losing the box downstream or even just having it shift and dump the day’s work is enough to warrant spending a minute or two finding a rock to do the job. Hopefully you’ve sample panned the area and found some decent ground before setting up the sluice. If not, it is wise to do this before beginning. Gold does not settle out evenly nor is it distributed evenly throughout the gravels of a stream, so it’s always a good idea to pan material from a variety of likely spots and pick the best one before start to do the heavy lifting. At this point, it may be desirable to “classify” or presort the material to pull out the larger rocks. Or, excavated material may be run as is and large pieces of rock picked out of the sluice by hand. The choice comes down to a matter of preference and the size of gold you’re after. 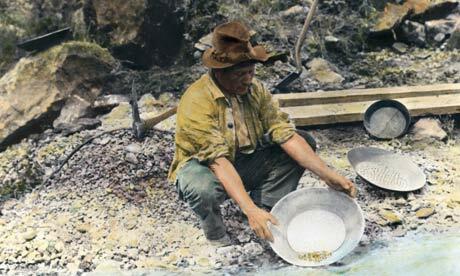 Classification adds time, and means processing less material overall; but it’s always easier to separate gold from material of a similar size, and larger rocks in a sluice may create unpredictable currents that may dislodge previously trapped gold and send it out the end of the sluice box. Nuggets aren’t as likely to wash out, but if you’re digging an area rich in fines, large rocks can be a problem. Presorting or “classifying” material before operating a sluice is generally beneficial. Material should be fed into the top of your sluice slowly, and given adequate time to wash through the box before more is added. Overloading only clogs the riffles and sends gold downstream. Use a large garden trowel and process one scoop at a time. When ready to stop and clean up, additional care is needed based on the material being washed and prior experience. Let the water flow for a bit after the last scoop of material has been introduced. Then carefully lift the sluice out of the stream, being careful not to slosh water and material out of the box. Place the downstream end of the sluice in a clean-up tub or bucket and inspect for visible nuggets. Then release the riffle tray catches. Rinse the riffles and any carpet, miner’s moss and/or matting used on the sluice bed and rinse well before setting aside. Repeat this process during the day, gathering the residual “concentrate” for later additional processing or separation. There you have it. Best of luck sluicing for gold! And if you want to try sluicing for gold in Guatemala, you are welcome to contact us if you wish. The Motagua river and its tributaties await you.